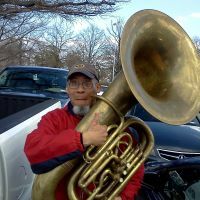 Carson McTeer was the first owner and he played this tuba in the Cincinnati Symphony. It’s a wonderful, easy to play flexible instrument that has been used successfully in a number of big orchestral auditions, to include New York Philharmonic, National Symphony and Montreal. It comes with an Altieri bag made with extra padding in fair condition. It’s had a full spa treatment, chem clean, polished, new felts, etc..
I’m in Atlanta and would rather not ship. Last edited by Tubadork on Sat Sep 29, 2018 10:52 am, edited 9 times in total. You should check out the pics, they’re really pretty. On your link, silver plate is $18,400, which is stated in my original post and I included that actual link. From the take your PCK of the litter thread there are 5 PCK’s for sale including mine. The first link is for $11,500. That is much lower than my price, but it’s in Portugal. The second link is for $13,000, but has no pictures and not all that far away from my price. The fourth the price is listed in the Facebook ad as $12,000, which is less than mine, but it has a replacement leadpipe in raw brass and has some bell scarring from that modification. Mine is in great condition, it’s plays great and was played by someone in a major symphony (Carson McTeer in Cincinnati in case you didn’t see that). I guess it’s hard for me to see my price as interesting, but you’re welcome to make an offer. If you’re here to kick the tires and say that maybe my silver plated horn needs to be $10 less than Dillon music’s raw brass horn, I’ll give you that discount. I was going to Delete porky's post, but Bill did a fine job with his reply. If you really wanna hear what it sounds like in the back of an orchestra! Depending on timelines, Carson may have used this in Cincinnati recordings issued on TELARC. I’m open to offers! (Sorry no trades). Re: Gronitz PCK for sale Open to offers, no trades. A really great example of this model of tuba. Someone is missing out on a great instrument! So here are some pop music sound clips that I used the Gronitz on. The first is with Blair Crimmins and the Hookers, the tone of the overall track is supposed to sound like an old radio, but you can tell how nice and clean it can play. The next two are from a singer songwriter type album and like most of them, they bury the tuba track, but there are at least two tracks on each in different octaves. You’ll feel it more than hear it especially with a subwoofer. It’s really a great horn and I’m open to offers. Re: Gronitz PCK for sale Open to offers, new sound clips . Would really like to move this horn soon!